Anglican Schools love to talk about the importance of ethos. Used synonymously with atmosphere, climate, culture or identity, we often don’t unpack what it looks like or how we create it in any concrete way. When teachers are employed they may agree to uphold the Anglican Ethos of the school but they may not have any idea what it is they are upholding. It is possible the school is not sure either. School leaders play an enormously important role in developing the ethos of the school but the classroom has an ethos of its own that is shaped primarily by the teacher. Classroom ethos is potentially more powerful in shaping a student’s attitude and response to the faith life of the school than anything a Head might say. If we are seeking to develop Anglican ethos in the classroom there are two keys questions that need to be addressed. Firstly, what are our methods for creating ethos? Secondly, what does the ethos we are trying to develop look like? In the Anglican Church Southern Queensland we have sought to answer both these questions in the one document called Anglican Ethos in the Classroom. We have identified three key methods or elements for ethos creation. These are: personal modelling, student mentoring and culture building. While these elements overlap in their implementation each has a particular focus. Personal Modelling is the disciplined or purposeful use of the self to express or demonstrate character, beliefs and values through actions, words and responses. Those who work in a professional capacity with people do this all the time. We choose carefully the words we say, how we express ourselves and what actions are appropriate for any particular audience. It is not about being inauthentic it is the realisation that we must present particular aspects of ourselves for the wellbeing and development of the people we are working with. Student Mentoring is the purposeful use of a relationship. In the case of teachers it is the individual guidance and nurturing that they give to each student. Once again the activity is focused on the well-being, growth and development of the student. Culture Building is the purposeful shaping of a community, in this case the community of the classroom. It is the development of the relationships in this community in a way that creates an environment for flourishing. It is about shaping how in the classroom people might interact, behave and express themselves. While we have defined each of these elements as being purposeful or intentional the reality is that they occur whether we are intentional or not. The teacher is always modelling, mentoring and culture building through their being and their practice. Ideally this should be intentional and disciplined in its implementation so that a desired ethos is created and not an unwanted or accidental one. This quote from Elizabeth Manvell describes perfectly what we are talking about. What personal traits, values, habits would you like to see your students develop? How are you purposefully using personal modelling, student mentoring and culture building to help your students develop these traits, values and habits? We can apply a similar question in regard to Anglican or Christian ethos as well. How are you using these three elements to develop Anglican ethos in your classroom? What would Anglican Ethos even look like in a classroom? And why does it matter that it is developed there? Borrowing (but changing) a metaphor used by “What If Learning” we might think of Anglican Ethos as chocolate in a cake. The cake is the school and Anglican ethos is the chocolate. We can have a plain cake with chocolate icing. In this case the Anglican Ethos is represented by a few special things the school does to highlight the Christian faith – for example special Christmas and Easter activities, Christian symbols around the school, an Christian name for the school perhaps. But should Anglican Ethos just be the icing on the cake? 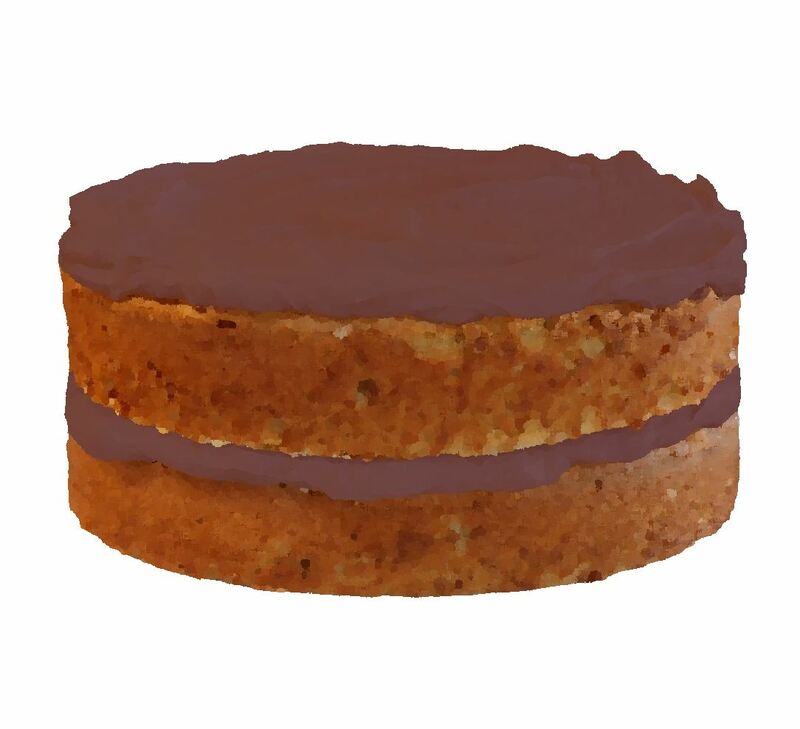 At the next level we have a plain cake with chocolate icing but also with chocolate cream in the middle. The cream in the middle are all those things where the Christian faith is brought into the life of the school – religious/Christian education, chapel, service activities, chaplaincy. Chocolate filling is better than just chocolate icing. But the ultimate goal is triple chocolate – to have chocolate cake with chocolate icing and chocolate filling. We have triple chocolate cake ethos when the Christian and Anglican ethos permeates all aspects of the school. This can only happen through all staff members contributing their little bit of chocolate, their bit of Christian culture and Anglican ethos into the school every day. When teachers participate in our Anglican Ethos in the Classroom professional development session in Southern Queensland we ask at the end: what is the bit of chocolate you are adding each day? We realise that teachers have lot to deal with so we want the implementation of ethos to be manageable. 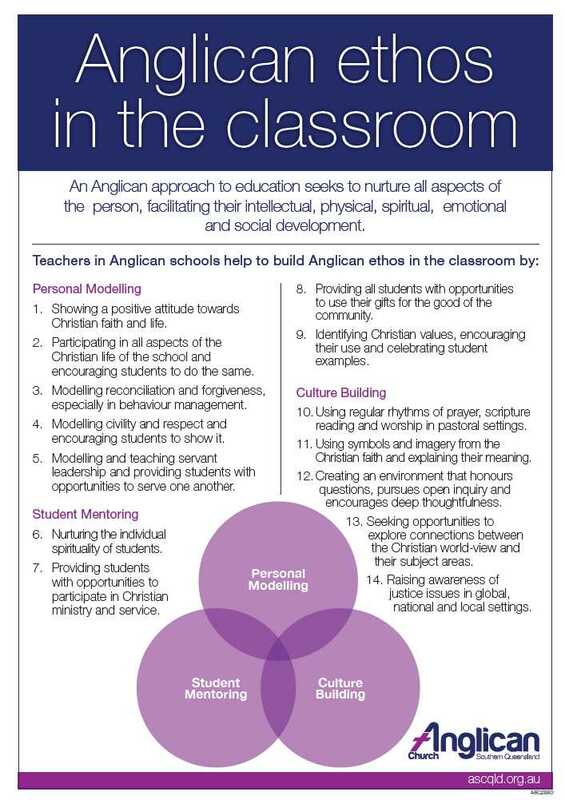 In Southern Queensland a group of chaplains and teachers from Anglican Schools developed a document called – Anglican Ethos in the Classroom. The purpose is to provide teachers with concrete ideas about how they might add their bit of chocolate. You can see the whole document here, but below are a few examples from each of the three elements of ethos building. Showing a positive attitude towards Christian faith and life. Participating in all aspects of the Christian life of the school and encouraging students to do the same. These two activities may seem simple and obvious but they are vital for the Christian life of any school. I have heard anecdotal stories over the years of teachers who support student’s dismissive attitudes towards elements of the Christian life of the school such as chapel or religious education. This is highly destructive of student regard for the Christian life of the school because of the influence teachers have with students. I have also heard from time to time that Principals or key leaders in schools don’t attend chapel on a regular basis. This sends a message about what is important and valued in the school. In some schools, particularly if chapel is held in a multipurpose facility, teachers may be found on laptops or phones during chapel. Again this sends a particular message about who chapel is for and the value that is attached to it by influential adults. Positive role modelling by teachers and leaders in a school is a vital first step if a Christian ethos is to be developed. Nurturing the individual spirituality of students. Classroom teachers have an individual relationship with every student in their classroom. Students will bring to the school their own experiences, ideas and questions about their spiritual self. Teachers have a role to play in responding to individual students in a way that nurtures their spiritual curiosity, questions and development. This might occur in the individual conversations that occur as well as how questions are answered with sensitivity in the classroom. Students may need to be challenged or encouraged or cared for depending on where they are at in their spiritual journey. Using regular rhythms of prayer, scripture reading and worship in pastoral settings. Patters of prayer and engagement with scripture should not be simply left in the chapel setting. The classroom provides a more flexible context for students to ask questions, learn how to pray, and ponder scripture in a way not possible in the chapel setting. They also get to see their teacher as a person who engages in these activities even if it is as a beginner, learner and explorer like themselves. Of course all of this requires teachers to be equipped. But if we are serious about developing a Christian ethos and having a greater impact on student faith development than we currently do we need to consider carefully what it means to develop Anglican ethos in the classroom setting. How are you helping your teachers to add their bit of chocolate? Stephen has a passion for exploring mission and ministry. He has worked for the Anglican Church for the last twenty years mostly in the area of youth and children’s ministry. In this time he has worked for two churches, two Anglican schools, as a university chaplain and for the Brisbane Diocese as the Youth, Children’s and Families Officer. Currently he is the Director of Mission for the Anglican Schools Commission. He has degrees in Science, Theology, Community Welfare, Education and has completed a Doctorate in Ministry, focused on the church’s mission in Anglican schools.